Home staging is a surefire way to help prospective buyers visualize themselves in the space, sell a house faster and help boost the sale price of a home. In fact, though there are numerous factors that go into what a home is worth and what buyers are willing to pay for it, staging is an excellent tool that can give sellers an edge, according to the National Association of Realtors® (NAR). In addition, while some home staging professionals believe staging a home can bump the sale price of a home as much as 6 to 20 percent. Either way, it’s clear home staging helps sell a home for more money. Thus, if you’re putting your home on the market or you already listed it, then you should seriously consider staging. You can start the staging process by calling A.B. Richards, the leading supplier of ground-level storage containers in the Northeast since 1982. Conveniently, cost-effectively and safely store items close by while keeping them out of the way of potential buyers looking at your home. Declutter your home so prospective buyers don’t get distracted by extraneous or oversized items that would otherwise prevent them from seeing the possibilities of the space and envision themselves in it. Remove furniture and other belongings and give your home a thorough cleaning in preparation of putting your home up for sale. Clear your home while you make repairs and remodeling updates ahead of selling your home. Hold a garage sale to rid your home of clutter before your home is sold. We offer homeowners 20ft containers that can be delivered quickly to your home. These particular units offer approximately 25 percent more storage space than other comparable containers on the market. In addition, all of our on-site storage containers are fireproof, weatherproof, and feature high-quality, 14-gauge stainless steel construction with sturdy swing-out doors. Remove excess furniture and place remaining furniture in small groups away from the wall to make the room seem larger. Clean out the basement, attic, shed and garage. Clear out drawers and closets. Clear countertops, showers and tubs. Use simple, large-scale pieces of décor and mirrors as focal points, and remove small-scale items. Don’t forget about the outside areas and curb appeal of your home. Remember sparseness is the key to making your home resemble a model home. Consider hiring a cleaning service. Consider consulting with an Accredited Staging Professional® (ASP) or asking your Realtor® for guidance. Contact A.B. Richards at (800) 597-5971 today to have one or more storage containers delivered right to your location. Our portable storage experts can tell you more about our storage container rentals and leasing options, and can help you select the exact storage container that meets your needs. 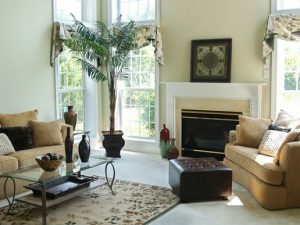 We also know the effort you put into staging your home using these tips. By using a portable storage container it will surely fetch a higher asking price for your home. Good luck, and we look forward to helping you as you take the first steps toward selling your home!